This promotional MagicSlider was a rare giveaway to WDW Annual Passholders in late 2013. You had to renew your pass within a very specific timeframe to get one of these. 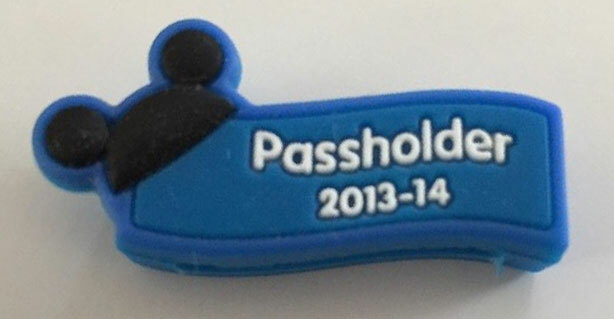 Unlike other promo sliders, this one is shaped like a wave and gives it a unique look and it contains both years that an AP holder would have had their pass be valid in. I had no idea these even existed until one appeared for sale recently, and unfortunately I missed out on it. 3 Responses to "2013 Annual Passholder MagicSlider discovered"
I never knew these we so sought after. I have one of them. I renewed my pass at the very end of December. So I guess I JUST fell in the time frame to get one. Really?!? I got one of these… I took it off my band, I don’t even know where it is. Now I have to look for it, who knew it would be valuable to a collector!!! !